To encourage the installation of solar-power generation equipment by the private sector, Taiwan's Ministry of Economic Affairs (MOEA) recently announced its target to promote the installation of 500 megawatt (MW) of such equipment in Taiwan this year, which calls for total investment of at least NT$45 billion (US$1.36 billion). The Bureau of Energy (BOE) under the MOEA has encouraged the private sector to install solar-power generation equipment since 2010, while having continuously purchased solar-power generated electricity from the private sector through the state-run Taiwan Power Co. In 2015, the installed capacity reached 500MW, compared to only 70MW in 2010, to show an uptrend. BOE officials say that in Taiwan the average viable period for solar-power generation is 1,250 hours, out of 8,760 hours per year. 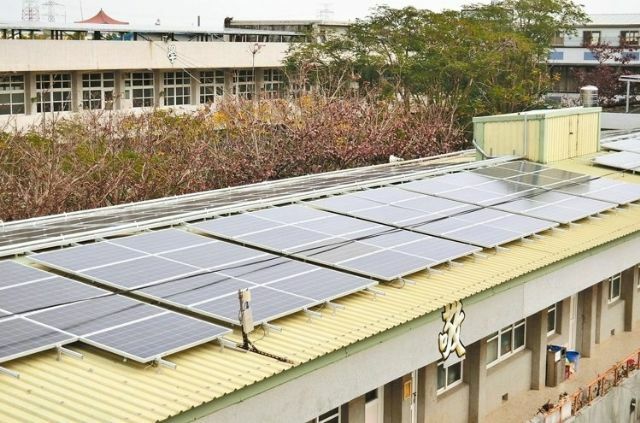 Typically a roof of some 30 pings (1 ping equals 36 square feet or 3.3 square meters) can be installed with 10KW solar-power generation equipment, from which a homeowner can expect annual income via generated electricity of about NT$81,000 (US$2,455). To enable private investors in solar-power generation to achieve equivalent return-on-investment of 5.25 percent, the officials added, Taipower's buy-back prices vary from NT$4.66 to NT$6.48 (US$0.14 to US$0.2) per KW-hour (KWh). From 2016, Taipower will buy back 150MW of solar-power electricity from equipment investors with smaller capacities based on publicly announced prices. The original threshold for smaller-capacity electricity sellers was 50KW, which has been raised to 100KW; while qualified sellers can directly sell electricity to Taipower without the need to submit tenders to win a contract with Taipower. To attract high-quality equipment investors, meaning those adopting high-efficiency photovoltaic (PV) modules, Taipower will also directly buy back electricity from them according to announced prices without requiring investors to bid. To large-capacity electricity sellers, who are required to offer a discount rate, the higher discount offered, the more likely they are to win the priority right to sell to Taipower. Originally the discount rate was 70 percent but from this year can be negotiated individually according to the seller's capacity. Equipment investors with generation capacity lower than 40MW can sell their power without offering discount, while those with 80MW-plus capacity are still required to offer 70 percent discount this year. According to BOE's estimate, installing 1KW solar-power generation equipment costs NT$70,000 to NT$90,000 (US$2,121 to US$2,727), and MOEA's targeted 500MW goal is expected to attract some NT$45 billion (US$1.36 billion) in investment. The MOEA has announced eight solar-power electricity buy-back tenders to be issued in 2016, with the first already completed in early January.